If you’re on this page, it means you want to find out more information about derma rolling for hair growth. I’ve outlined more information below as well as my purchase recommendations. The derma roller is a cylindrical shaped drum studded with very fine needles of various lengths. The needles are used for breaking down old scar tissue and stimulating the skin cells to reproduce rapidly and form new tissue layers of elastin and collagen fibers. The derma roller comes in various sizes ranging from 0.25 mm to 2.0 mm and the size you choose depends on which skin area you are going to use it on. For the scalp, I recommend 0.55 mm in length with titanium needles. Though the needles look scary, they are harmless and cause no more than a prickly sensation. Below is a picture of bald spots treated with the derma roller and the results after 8 months. 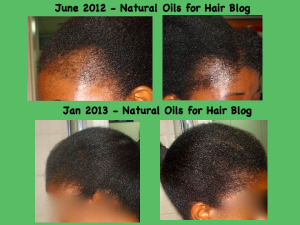 I’m the person in the picture and the bald spots is what prompted me to start learning more about natural oils and hair. The derma roller is a proven technique that will help you stimulate growth in the bald areas on your head combined with other techniques such as bamboo leaf tea and hair supplements. The derma roller can be used at home safely without any side effects and there’s no downtime. You can email me for safety tips after you purchase. Whichever derma roller you decide to buy depends on your budget but both are equally effective. 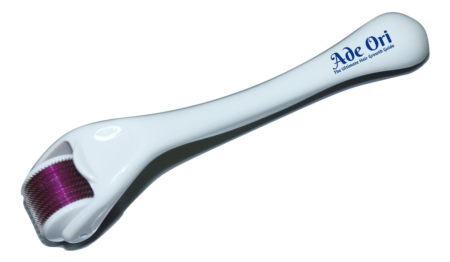 If you have any questions after purchasing the derma roller, feel free to reach me through my Ask Abi page. I usually respond within a few days.